Caption slip reads: "Photographer: Richardson. Date: 1952-02-06. Reporter: Swaim. Assignment: Accident, Angeles Crest. 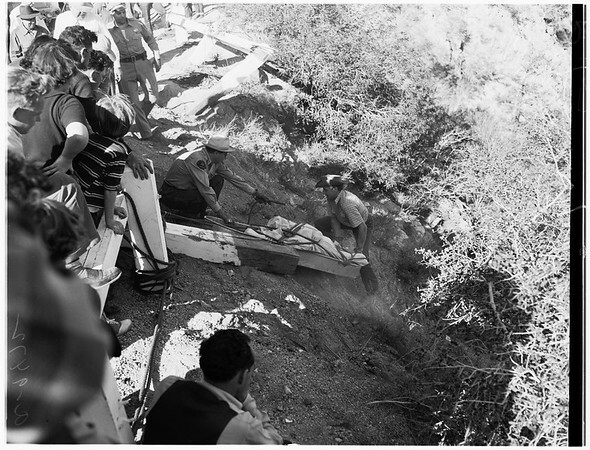 K17, 18, 21: Body of Sydney D. Ulrey, 72, being lifted to Angeles Crest highway after 400 pull with ropes. Men are Sheriff's reserve mountain rescue crewmen. K3, 4, 9, 10, 13, 14, 22: General shots, rescue operations bringing up basket stretcher with body of Sydney D. Ulrey, Lancaster. (None of these shots show body or basket). Man in white shirt directing operations is Capt. Robert A. Cook, Montrose Sheriff's substation".